Welcome back to the Colors of Modern! This is a five-part series of articles focused on analyzing the varying impact each color in Magic has upon Modern, based on the individual cards that see play in the format and, to a broader extent, the archetypes made possible by these cards. If you missed the previous articles on white, blue, or black, check them out. Today, we’ll be focusing on red; analyzing its color identity in Modern along with the strengths and weaknesses associated with common archetypes that employ the color. Let’s go! Surprisingly, red is one of the deepest colors in Modern. Before we go into what makes red work, I’d like to talk a bit about my organization philosophy for the above list. Staples, in my mind, are unquestionably powerful spells that are considered auto-inclusions in certain archetypes (and powerful elsewhere) or enable whole archetypes by themselves. Lightning Bolt needs no explanation, as it is ever-present in the format and many archetypes stretch to red just to play Bolt, but almost everything else can be argued as stronger or worse than another option. The line between staple and strong option here is very blurred. Take Kird Ape, for example. I originally had it in the staple category because it is close to the baseline for the best rate we will get. Behind Goblin Guide and Monastery Swiftspear, Kird Ape can argue for the third best red one-drop spot. As we’ll discuss below, red benefits from a highly interchangeable color identity, where the third or even fourth best option can rival the best one. Another good example in this area is Galvanic Blast, which obviously can’t be utilized by a majority of archetypes, but in the hands of Affinity becomes an almost strictly better Lightning Bolt! While this list could be exhaustive, and include spells such as Lightning Storm and Tormenting Voice, remember that my main intent is to quickly show the major incentives to play a color and some general powerful cards to watch out for. If we start including every narrow card that archetypes use in Modern, the list will grow to twice its size and, in my opinion, loses its value. Red as a color in Magic does two things very well: attacking and direct damage. In Modern, this philosophy shines through, and indeed, many of red’s best cards are dedicated to these two strategies. Lightning Bolt is in conversation for the single best card in Modern, and the trio of Goblin Guide, Monastery Swiftspear and Eidolon of the Great Revel make Burn (and a few other red aggressive variations) one of the strongest players in the format. Unlike green (which we’ll get to next week) or white, red isn’t “thin” in terms of power; many “second” and “third” strong options are just a step down from the staples. Lava Spike and Rift Bolt obviously don’t hold a candle to Lightning Bolt (fire joke, see what I did there!?). But in the context of Burn they combine to perform at least similar tasks while offering a certain degree of interchangeability between them. In many matchups, a Lava Spike in our opening hand is almost the same as a Rift Bolt, while in green a Tarmogoyf compared to a Scavenging Ooze is quite different. This characteristic can be attributed to red’s strongly-defined color identity, which has remained focused throughout the years of Magic. Numerous iterations to the mold have allowed for this depth that we see here, giving us plentiful riches in the form of Goblin Guide/Monastery Swiftspear/Kird Ape, Lightning Bolt/Lava Spike/Rift Bolt and Skullcrack/Atarka’s Command. As a result, red is indisputably king when it comes to attacking and direct damage, but beyond that things start to get…weird. Before going into red’s secondary strengths, it would be heresy to write a red article without a discussion of the Burn archetype. Sandydogmtg (Brandon Burton for those who don’t know) has been grinding MTGO for as long as I’ve been playing the game it seems, and you can always count on his lists being very tight. Here we see Burn doing normal Burn things, playing cheap creatures and flinging three-damage spells to get the opponent dead as quick as possible. For those that have been under a rock for a while, most Burn decks nowadays stretch to fully embrace green for the Kird Ape upgrade in Wild Nacatl, and the Skullcrack upgrade in Atarka’s Command. We were already playing green anyway for Destructive Revelry/Ancient Grudge in the board, and having that 12th strong one-drop is so essential to this archetype’s strategy. The one thing I’ll say about this archetype is that I’ve always appreciated how very pure it is. Simple, efficient spells that all work together to accomplish the same task (do twenty damage with 7 spells). Purpose-driven, this archetype cares little for what the opponent is doing as long as it’s not Leyline of Sanctity or similar spells, and its primary concern is fighting the top of its own deck. No crazy math like Affinity or patient, slow-poking from Infect. Just pure, solid fire-throwing. Land destruction in Modern benefits from a deep pool of powerful options that include “old-school” powerhouses and “new-school” strong additions. At the top of the list is undoubtedly Blood Moon, which remains one of the strongest alternate angles of attack in Modern and can be built to taken advantage of without too much trouble. We could talk about the effects of Blood Moon in Modern for a whole article, but for now, I’ll just remark on its strength keeping Tron strategies in check, while also keeping the format honest. In a fetch/shock format it can be relatively easy to stretch to three or even four colors without too much trouble (and the Gifts Ungiven decks do this quite well). Blood Moon exists to keep these monstrosities in check, punishing them (along with the aggressive side of red) for their slow, greedy manabases. Beyond the king of land destruction, red benefits from multiple powerful options, each with their own strengths and weaknesses. Fulminator Mage is strong when we’re looking for a fast, small effect and can be rebought with Kolaghan’s Command, while Molten Rain is almost the same spell but works better with Snapcaster Mage and Jace, Vryn’s Prodigy. Crumble to Dust works well when a bigger effect is desired and is strong against Tron specifically, but can be quite awkward against Scapeshift. The intricacies of which land destruction spells to use in Modern can be quite complicated, but the tools exist to fight big mana as long as access to red is obtained. Red’s access to artifact hate mimics the land destruction situation, where there is a clear top tier and everything else exists interchangeably slightly below. That top tier is Ancient Grudge, which can singlehandedly ruin Affinity and Lantern Control’s day, even through disruptive elements like Thoughtseize removing it from hand. Beyond Ancient Grudge (or if we need to stay mono-color) multiple spells accomplish the same task, but in slightly different ways. Shatterstorm is great for when a large effect is needed relatively quickly, and it’s often seen alongside ramp strategies. Vandalblast is a personal favorite of mine, as it can remove a Signal Pest or Expedition Map early, while devastating entire boards late. Lists that use Shatterstorm over Vandalblast either can’t hit five mana reliably, or plan on having access to four mana on turn three through a turn two ramp spell, where they can take advantage of the four CMC spell much more smoothly. Finally, as if Burn needed any more help, Smash to Smithereens provides utility that advances Plan A at the same time. A little aside on the two sections above. It might seem unnecessary to devote three paragraphs to the intricacies of red’s LD and artifact hate sideboarding decisions, but in my mind that’s where red’s hidden strength lies in Modern. It’s a common misconception that red is easy to play, and while many of red’s primary goals might be simple (kill them!) the hidden depth that accompanies red’s deckbuilding decisions can often be the difference between victory or defeat. While a player could easily just throw one of the LD spells in the sideboard for the Tron matchup and do “fine,” real points are earned when a true understanding of the relative strengths and weaknesses of the multiple options available to us are evaluated. End aside. Finally we come to combo. Weird combo in red is all over the place, so bear with me as I just go from one to the next. The now-banned Splinter Twin existed as a cheaper, less fragile Kiki-Jiki, Mirror Breaker, but the original remains. While the old blue-red control-based Twin archetype has died off, Kiki-Jiki persists, enabling infinite combos in Naya creature strategies and threatening general value alongside creatures with enter-the-battlefield abilities. Through the Breach, alongside ramp spells, sneaks Primeval Titan and Emrakul, the Aeons Torn onto the battlefield quickly (and very unfairly, if you ask me). Pyromancer Ascension epitomizes the “quirky red enchantment” and can be absolutely devastating on the right weekend in Storm. Finally, while not necessarily a combo per se, the various red draw spells like Burning Inquiry, Goblin Lore, Faithless Looting, and Tormenting Voice enable multiple graveyard-based combos and value-generating effects out of Dredge, Grishoalbrand, and Mardu strategies. Rather than present a few decklists that utilize red cards and give some discussion about them, I think it would be better to do something a little different this week. Most but not all of the top archetypes in Modern use red for its best spells (Lightning Bolt, Galvanic Blast, Kozilek’s Return and sideboard spells out of Tron) but don’t really epitomize the identity of the color. What can I say about those decks concerning red other than, “Lightning Bolt is good?” Besides, this is a red article, and red doesn’t follow rules. Let’s turn to another list by a prominent pro (ArsenalMunch is the MTGO name of Shaun McLaren). Not counting Burn, WR Control is probably the best example of a true “red deck” in Modern, if we’re talking color identity and philosophy and not just powerful cards. Relying on the general utility of Blood Moon in the format as we discussed earlier, WR Control looks to disrupt the opponent and keep them off-balance while ignoring the primary path to victory in Modern of attacking with creatures to deal twenty damage. Instead, WR Control seeks to kill creatures, buy time, and draw cards with Wall of Omens and Nahiri, the Harbinger, all while building towards a Nahiri ultimate that puts Emrakul, the Aeons Torn into play. The deck is solid, reliable, and surprisingly powerful considering it lacks many of the “no-brainer” cards other archetypes play in Modern. As a quick note, John Pellman took 8th at SCG Indianapolis with a more white-based, prison-focused take on the archetype, and his version is definitely doing interesting things as well. Judging by his strong finish, we can at least raise our eyebrow at his being the better version, but I trust Shaun McLaren and for the purposes of this article I’m interested in seeing a heavy red take on the archetype. One of the most interesting things about this archetype is that though it has been around for a few months now, it’s still relatively unexplored compared to the hyper-tuned lists of other strategies. This allows for innovation, interesting discussion and plenty of surprises. Nothing like a unique archetype to get the creative juices flowing! Unfortunately, the archetype suffers from the very thing that makes it unique. Besides Blood Moon, which can be played around and planned for if it’s expected, other land destruction spells just aren’t scary against fair mana decks. Sure, Boom // Bust on an opponent while they’re land-light can be scary, but land destruction as a strategy has always suffered from the fact that no matter how many lands you destroy, the opponent can just draw more. If we’re just looking at resources, land destruction is fighting the opposing draw step, where the opponent has on average better than a 33% chance to find another land. LD strategies can’t afford to play 20+ destruction spells, so in the long run they will always lose out. In addition to this, the archetype really only has five ways to win: planeswalker ultimates. It benefits from the fact that planeswalkers are damn hard to remove in Modern, but relying on planeswalker ultimates to win games has always been a sketchy prospect. It just takes too long, and if the opponent finds an answer we’re back to square one. 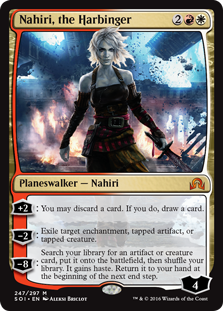 Really, this archetype is held together by the relative power of Nahiri, the Harbinger—I say relative because at any time the format can wise up and start packing Detention Sphere or Maelstrom Pulse to send this archetype packing. It seems that might not even be necessary, however, as in recent weeks WR Control has gone from format mainstay to almost disappearing from the format. This archetype definitely highlights some of the under-the-surface strengths of red in Modern, but ultimately proves that those strategies should exist in support of its primary power: attacking with creatures and sending burn to the face. Solid article on Red. I believe this one and the white article have been the best so far. Red was a tough one to tackle because of everything you mentioned. How does a Young Pyromancer fit the same identity and feel of an Eidolon?? It’s quite a stretch, but I think you touched on it all. I may be biased too though. I do love me some red. Young Pyromancer should definitely be on the list, I wouldn’t call it a staple as Modern just seems to be a little two fast for a 2/1 two drop that requires either free spells, playing it late, or untapping to generate any sort of value, but it is an excellent card and one of my favorites. I try to make sure I caught all the good cards, but inevitably one or two slip through the cracks. Nice catch! Oh sorry! I guess I could’ve completed my thoughts. I was saying that Young Peezy certainly stretched what it means to be red! Comparing him to another red two drop such as Eidolon, YP sounds more like a blue card(which would be awesome and insane), or more similar to Pyromancer’s Ascension. Going on to speak about Pia and Kiran, that’s a REALLY red card, shock damage, artifact inclusion, small bodied, but cost prohibitive*(stretch of the term). There’s just so much to substantiate your thoughts on a secondary, and perhaps a third, identity to Red. The short if it is: you did great this time around! No misses or anything. Solid work, homie. Great article. Just curious as to how Smash To Smithereens is a sideboard power house? Can’t even recall when I last saw it in a list. Feel as if Shatterstorm or Vandalblast should’ve been the pick there. Burning-tree Emissary is definitaly worth mentioning somewhere as well. Poor forgotten Chandra is interesting since it slots into the grindy aspect of red. Together with Outpost Siege, which is sometimes played in Jund SB. The original list had all three (Smash, Shatterstorm, Vandalblast) but we decided to trim the list down a bit and Smash was discussed in the article directly, so we kept that one in. In my opinion, Vandalblast is the best option for decks that can afford it that aren’t ramping, in which case Shatterstorm is best. In the end, they all accomplish roughly the same task, even though they all get played in varying amounts. Outpost Siege/Chandra are both solid options that I let slip through as well. Great suggestions!